SAVE THE DATE!!! 3./4./5. Juni 2017 Pfingsten Tango Weekend im SUR! Alja from Slovenia keeps it simple. You will surely know the first song of her tanda and it will drag you to the dancefloor. And while she will carefully weave the evening through the tandas of various moods, those who know her will not be surprised that the evening will leave a pleasantly romantic aftertaste. She plays music from the 30s and 40s and despite being in love with Biagi and Di Sarli, you can always bet on a Canaro tanda or two. Activities near the venue of Munich New Year’s Tango? The sports club Freie Turnerschaft München Süd is located in Munich-Sendling. This is a neighbourhood with residential housing covering the whole range from council housing to leafy streets with residences for the more affluent tucked away from the main roads. At Harras (where the U-Bahn-station is), admire some art nouveau style houses built around 1900. What the guides won’t tell you: The somewhat controversial late Minister President of Bavaria Franz-Josef Strauß used to live in Sendling with his family for many years. First in a high-rise building in Listseeweg, later in Hirsch-Gereuth-Straße, one of the more leafy roads. He grew up in the Munich neighbourhood of Schwabing, in a rear building at Schellingstr. 44.
visit http://www.muenchen.de/stadtteile/sendling.html. At the top right click on international to view the information in other languages. I like to DJ using the traditional format in Tandas with Cortinas, selecting the Tangos from the 30s to the 50s. Additionally I give Workshops for DJs or talks and lectures about musicality for dancers or interested people. 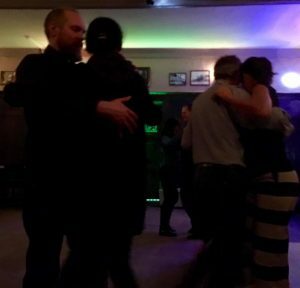 I like to dance social Tango guided by the codigos in traditional Milongas and at Encuentros. Melina has been DJing (and greatly enjoying it) since 2004 at local tango events, as well as at international Festivals, Encuentros and Festivalitos all over Europe and the USA. Her goal is to create a harmonious flow of music for social dancers by finding the right balance between rhythmical and lyrical music from the late 20’s to the late 40’s. By adding one or two more dramatic tandas from the 50’s, Melina assures, that everyone will enjoy the energy of the Milonga. The happy faces of the dancers attest to that.